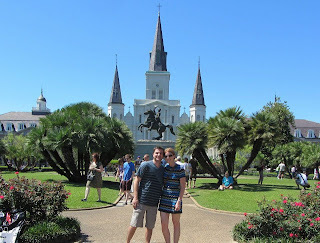 New Orleans is our happy place. I will even state it is my favorite city to visit in the US. A short one hour direct flight from home and we are in the Big Easy, sipping on Hurricanes, eating crawfish and being blissfully happy. 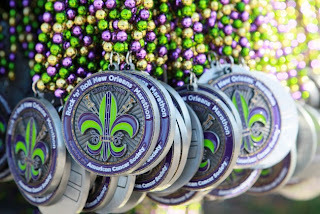 I am excited to state I have a discount code for my readers for the 2013 Rock and Roll Half Marathon in New Orleans, ROCKNOLA2. A few months back, Gabe and I made the decision to take his graduation trip in the months following December due to so much going on for the holiday's. We then saw that the New Orleans Rock n Roll Half & Full Marathon is scheduled for February 24th. We can go on vacation and do one race we always talked about doing. Originally we were going to do the 2 person relay but being we are doing the Rock n Roll St. Pete Half as well, we didn't want to jeopardize not receiving our heavy medals for running multiple RNR races. So here we are, signed up for three half marathons within a month and a half span!! I am super excited about running the Rock and Roll Half Marathon in NOLA for multiple reasons: It's our favorite city so it makes sense to make this our first out of state race. We love the architecture of the city, I cannot imagine a prettier race. I cannot imagine a bigger after party. 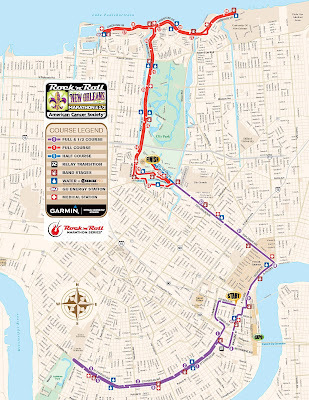 The Rock and Roll Marathon course is below, the purple line is the half and the full marathon is both the purple and red lines. I have a feeling the on course entertainment for this race is going to rock. Literally. Both sets of our parents are coming up for the race! My Mom hasn't been to NOLA in 35 years and none of the other parents have ever been. This is going to be one crazy trip! Although Gabe has been to NOLA before, he has never seen Bourbon Street during the weekend. He has no idea what he is going to encounter. The coupon code for the Rock and Roll Half Marathon New Orleans will save $10 off your entry fee. Again, it is ROCKNOLA2 and you can click here to register. If you are coming up for this race, send me a note. I would love to say hello before or after the race! I absolutely adore New Orleans, but I am no where near able to run a half marathon. I'm shooting for a 10k this year! But this might just be "the one" for me to do the following year! I think that's great that you are offering a coupon code! Make this your goal for 2014! I know you will do great on the 10K. The Rock and Roll series work really well with bloggers and I love that they offered me a code to two races for my readers! !